Image on the left is a 18th century Artist's rendition of the silver tree at Karakorum, as described by William of Rubruck. So Why was Kumiss produced and drunk? So, Why Kumiss? My theorty is that Horsemilk is very high in Lactose (40% higher than cow's milk) but low in Fat and Protein, which would make it a very rich source of nutrients for steppe cultures that relied heavily on the horse. 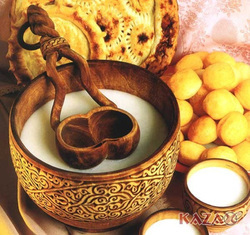 The only issue is that many Central Asian Tribes have very high levels (over 90%) of Lactose Intolerance. Although it's not known if the fermentation of Kumiss was accidental or intentional, it is a very efficient way of removing lactose from milk making it very digestible, with the positive side benefit of a small amount alcohol, usually 1-3%. The lactose in milk is not normally able to be consumed by Brewer's Yeast (Saccharomyces cerevisiae), being a complex culture (SCOBY) with Lactobacillus, there is the ability to efficiently breakdown the lactose, rendering it safe to drink. The Lactobacillius cultures excrete Lactase, an enzyme that breaks down Lactose into Glucose, absorbs the Glucose and excretes Lactic Acid. The yeast robs the Glucose and excretes Alcohol and Carbon Dioxide. The reaction is feed-forward. The more the yeast robs the glucose, the more the Lactobacillus produces lactase. This results in a very efficient method of removing lactose, thus rendering the Kumiss relatively low in lactose. ​How the Mongols made it? No culture is normally added, but the bags or vats would normally be inoculated with the correct culture. Cultures would be shared if they went sour. Stirring it in the bag in the warmth along with the culture would starts the fermentation process that creates a mild alcoholic “liquidy” yoghurt style drink. The stirring would assist in the breaking up of the curd. Hospitality mandates to present a bowl of airag to each visitor. A Mongolian will normally empty it, but it is also acceptable to just take a sip and return the bowl. To reject the offer right away would be gravely impolite. 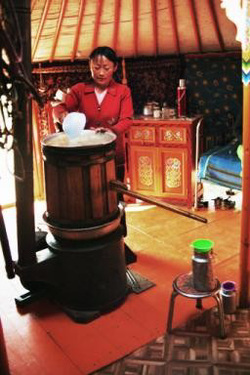 Occasionally, the Mongols distilled the airag to make a clear spirit called Arkhi with their homemade distillery. A bowl of airag is placed in the bottom of the metal barrel shape container, an empty bowl is fitted inside it towards the top of the barrel and a third bowl of cold water is placed at the top. All of this is placed on top of the stove, which is heated by dried animal dung. The airag is heated, evaporates and condenses on the bottom of the cold bowl and drops into the empty bowl. This can produce Arkhi up to 10-20% alc depending on the still. too much. A drinking yoghurt culture is perfect for this. Put into a small homebrewing fermenter, leaving some head space as the kumiss can foam quite a bit. One option is to get a winecask bag after the contents have been drunk, take off the lid, and place a rubber bung and airlock in it's place... This does a fine job at simulating a goatskin and allows for easy agitation. You need to agitate every few hours for a couple of days. Streptococcus lactis (also known as Lactococcus lactis) produces quantities of lactic acid, partially hydrolyses milk proteins, and increases digestibility of milk. It also produces chemicals (bacteriolysins) that inhibits other harmful micro-organisms. Lactobacillus bulgaricus has been used to culture yogurt in Eastern Europe for a very long time and it's no surprise to see it in Kumiss cultures... It has similar properties to Streptococcus lactis. Lactobacillus bulgaricus also produces small amounts of acetaldehyde which is apparently important for the final flavor profile. The third culture required is a yeast (Saccharomyces Cerevisiae), of which the Kumiss maker can select any low alcohol neutral tasting version they wish. The import thing is that the 3 cultures work in unison and not to select a yogurt bacteria strain know for a high rate of firming (clabbering) the curd and to avoid any culture that gives a ropy or slimy consistency. that milk products weren't available in that time/place (1456/Capital) and were omitted. Perhaps it was because the author was Chinese. The recipes themselves record the intrusion of alien (and some believe unsophisticated) Mongol cookery based on mutton into Chinese cuisine. 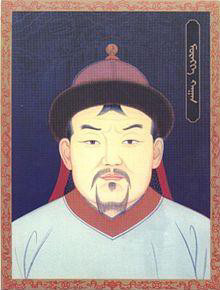 It was written by Hu Szu-Hui, who probably came from a bilingual Chinese-Turkic family in northwest China and who served as imperial dietary physician to several short-lived descendents of Qubilai Qan in the early 1300s. Although useless as a reference for Kumiss, it does contain information on other Mongol/Yuan Chinese alcoholic drinks.